I was going through my first CH cat blog the other day and couldn’t help but enjoy all of the success stories that have been shared over the years. Some accomplishments may seem larger than others, but as we all know, when it’s your cat who accomplishes something – no matter how small – it’s a big deal. Rosie climbing down from her perch. While these stories certainly allow us to say “Hey! Look at my cat! Isn’t he amazing?”, perhaps the best part of sharing success stories is giving one another hope. Hope that our CH cats can accomplish abundantly more than we may think, plus, these stories inspire us to find ways to help our cats reach their potential. So what are the most common challenges our CH kitties have overcome? For many, climbing is a bit accomplishment, but the stories really can vary. “He made it to the second level of the cat tree today… He was trying to kick Diva out of his cat ottoman by swatting at her from above, but still a big accomplishment,” Andrea says. And I think that’s just it. Sometimes when our CH cats accomplish things it may seem like a big deal to us, usually because in our heads and hearts we limit what they’re able to do. But since our cats likely don’t limit themselves, any “accomplishment” we view is likely daily living to them. That said, I do think our cats have goals for themselves. The first time I took CG to my brother’s home, where there are carpeted stairs, CG squirmed and squeezed past all of the roadblocks we put in front of the stairs so he could try them. 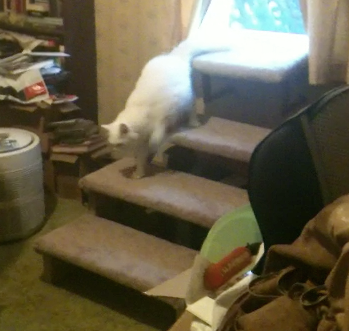 He then spent the whole afternoon going up and down the stairs, practicing! 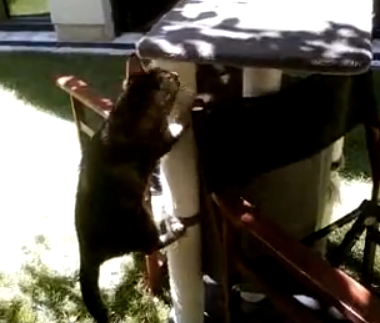 I feel like that same determination can be seen in this video of Jewel climbing her cat tree. She struggles, it’s clearly not easy, but Jewel knows what she wants and goes for it. Isn’t that so inspiring? Martha climbing her cat tree. One of the fantastic results of Christy sharing Flip’s story is that it inspired others. Toni wrote in about her CH kitty Rosie and shared a this update: After viewing Flip’s video of how he learned to climb onto a bed, Toni was inspired to build these steps so Rosie could climb to the window perch. It was a tremendous accomplishment for Rosie, especially because she came to Toni declawed! Tanya’s Martha has also had many of her own accomplishments – everything from climbing her hardwood stairs to climbing a cat tree! You should check out the jump she takes to get onto the cat tree, although Tanja makes it clear that Miss Martha uses a chair to get down. Mimosa and Harvey both excelled in using stairs, too. And while the accomplishments themselves may be similar, often the stories behind them vary – and how cool is that? It shows the possibilities are endless with our special cats! Interested in reading more inspiring stories? Check out these amazing profiles about readers’ CH cats – that means all of you! If your cat hasn’t been profiled, please email me and we’ll get started on that! Does your CH cat have his own success story? Please send it in! It’s not the getting up but the getting down that scares me with Poppie. He insists on coming up the stairs and I’ll find him on my bed. I’ll be downstairs and call “Yum yum yummy”, which means food. I’ll hear a big THUMP as he gets off the bed. I can’t believe that small cat can make so much noise. Then he whines as he has to come down the stairs. He’ll do it but he hates it. He forgets what goes up must come down. He’s six now and has traveled from Afghanistan to the US to Jordan and back to the US. He loves sitting in the sun in the yard within the cat fence but we still have problems with inappropriate pooping. Otherwise, he’s adapted well. I’m going to get some pet steps from QVC for my bed. My other cat won’t like it as he thinks the bed is his territory.